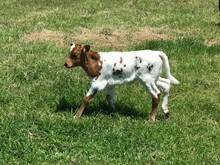 This Cowboy Up Chex daughter has huge potential to produce exceptional calves. 76" of total horn as a 3 year old, put a proven bull on her to lay those horns out and BAM! Reign is exposed 3P Concealed Hammer, Concealed Weapon x Shamrock Eternal Flame.